Ceiling Designs That Can Transform Any Room! 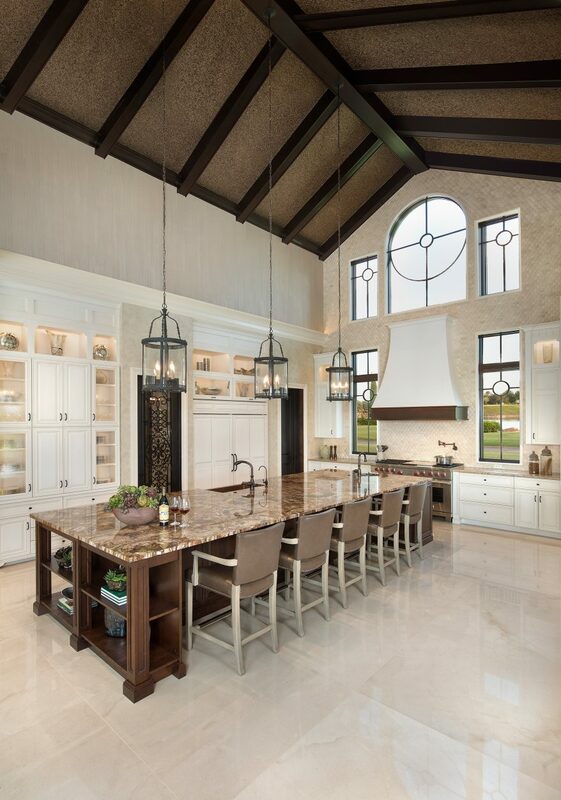 - Weber Design Group; Naples, FL. Home / Blog / Learning Resources / Ceiling Designs That Can Transform Any Room! Ceiling Designs That Can Transform Any Room! Give your new custom home design a unique and individual character that leaves a great impression to all that step into the room and view it. Ceiling design creations are unique to the room, the home owner and the overall theme of the house. We take great pride in the design of the ceilings we create to enhance each room with both form and functionality. Please view a sample of five ceiling designs below that we have incorporated into some of our luxury homes. Vaulted ceilings began centuries ago, they have the ability to take advantage of the high ceilings in your custom home plan t, creating a light and airy feeling and maximizing the natural light. They work well in most any room throughout a floor plan, whether it’s the bedroom, great room, kitchen or even the bathroom. Vaulted ceilings do a great job of making smaller rooms feel larger and larger rooms feel palatial! The word coffered comes from the French word for box (coffre), which is appropriate as they are essentially a defined box within the ceiling adding dimension and texture to a space. Coffered ceilings are among the more popular ceiling designs found among house plans today. This type of ceiling is formed with recessed panels surrounded by dropped beams creating a grid pattern. Those beams are sometimes exposed wood or perhaps the panels are painted, producing an interesting contrast against the interior walls and other décor. Coffered ceilings are a classic ceiling design and can be incorporated into most any architectural style. Whether it’s a West Indies house plan or a Contemporary house plan, this style ceiling can add architectural interest to any room! Creating room delineations in a bedroom like the one pictured above, is an architectural priority when designing a custom home. Designed to delineate a specific area, a radial coffer can create a hierarchy of space in a specific room. This style of ceiling design can also assist with the arrangement of interior furnishing and support the setup of different lighting moods in a room. Often times, the cupola is used to offer architectural interest while also admitting natural light into a space. Cupolas were originally seen as structures on top of buildings, used to provide a lookout space or assist in ventilation. Nowadays, we see them adorn the tops of garages, home offices or even bedrooms like the one pictured above. They not only give a new dimension to the inside of the house, it can be enjoyed from outside as well. Cathedral ceilings literally originated from their surname – cathedrals. By definition, a cathedral ceiling is a ceiling that has a center point higher than the walls with equal sloping sides that meet in the middle, conforming to the shape of the roof. 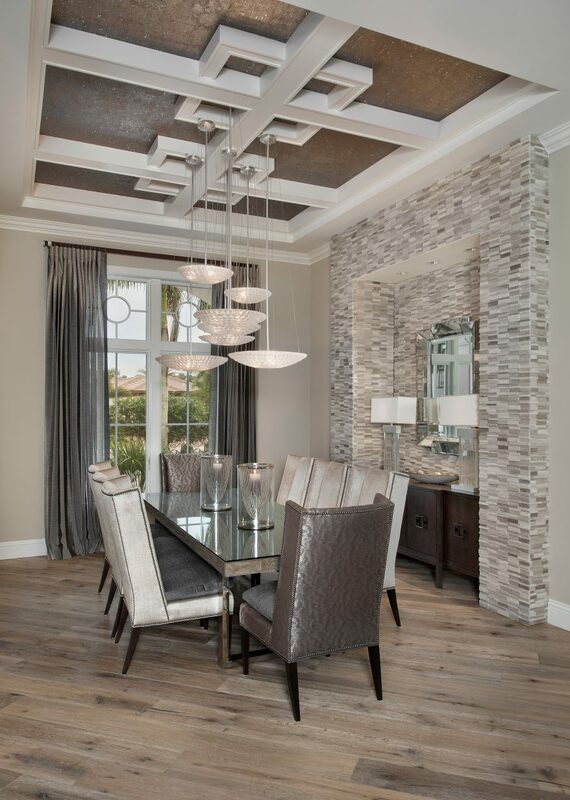 As seen in the photo of our Calusa House Plan, this family room is made symmetrical by the center ridge beam while the decorative brackets assist in the ethereal feel of the space. A cathedral ceiling design can truly create a ‘wow effect’ in any style home plan! Weber Design Group house plans offer a variety of ceiling designs within the floor plans we feature. If you find a home plan and would like to discuss changing the ceiling designs, please contact us for a modification quote. We’re happy to assist you with the customization of your new house plan!